“Baby” from the Constellate LP by Tensei. 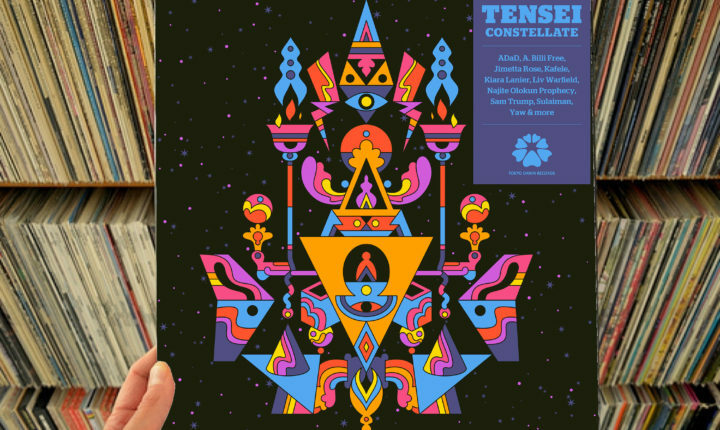 A deeper look at the grooves pressed into the Constellate LP by Tensei. Over the last few years, The Flaming Lips have really come a long way from being the LSD-dipped and surrealist punk band that they were when they emerged from the wilds of Oklahoma in 1983. Since then, the hard left musical turns that they were perceived to have taken have become streamlined and the group has developed a greater sonic palette with which they’ve been able to compose and conduct innumerable successes. The band has floored audiences in the process, and caused them to totally re-think how they relate to the band’s music, and (in turn) how the band now must conduct themselves in order to continue surprising their audience. Until very recently, it was widely believed that The Flaming Lips occupied a pretty peerless niche in the rock diaspora (some fans have gone so far as to quantify their recent recordings as meta-rock) but with the release of Constellate, Chicago-based sonic experimenters Tensei (which means “morning star,” in Japanese) have easily proven that the Lips are not alone. As soon as a needle picks up the groove on the A-side of Constellate and “Liquid Tongues” begins to play, listeners will begin to understand and be excited by the angle that Tensei is taking with their debut. There, a lush and obviously synthetic sonic palette manufactured by band principles Midas Wells and Chris Kramer is held together tightly by Tim Seiser’s warm and funky bass and Brandee Younger’s harp. It’s a similar sound to that which The Flaming Lips made on Christmas On Mars, but but made instantly more accessible and welcoming by A. Billi Free’s aching and soulful vocal performance which listeners will find very easy to sink into. The senses of comfort and contentment established by “Liquid Tongues” (which, yes, feel as unusual given the contextual setting in which they appear as they do anything else) endures beautifully as the strings and flute which colored that song so well shift gears and instantly become more foreboding at the top of “What If?,” the second cut on the side. There, the vibes instantly become less “Lipsy” and comparable more to hip hop bravadi and posturing as a stronger beat gives the cut a more stable, pop-informed framework, singer Liv Warfield inserts a sweet, self-assured vibe (think Lauren Hill and you’re on the right track) and a really infectious, swaggering groove. Comparatively, “What If?” simultaneously firms up the ideaput forth by “Liquid Tongues” as well as leaping headlong beyond it; from an experience standpoint, the song makes Tensei’s sound and the sensations it inspires more tangible and vibrant, and will have listeners rushing toward the music at every turn for the remainder of the side. First, “Amazing” gets just a little more “Seventies R&B” as contributing vocalist Sam Trump gets ominous with lyrics about days being numbered and finding one’s own safe path shape the structure of the cut, and makes it a work of art with a sense of history at its forefront. While artists like Maxwell and Cody Chesnutt have attempted to incorporate vintage R&B sounds like these in a post-modern context before, Tensei EMBODIES those elements completely, feels them and makes listeners feel them here. True, the results are about as far from the Flaming Lips strains which were implied at the opening of the A-side as it’s possible to get, but the change is a welcome one because the performance is so good and guarantees that listeners will already be hooked to follow the album through its B-side, long before the needle has even lifted from the A-. …And on the B-side, Constellate does return to space with “Baby,” emboldened by how strong the work on the album’s A-side proved to be. There, a really heavy and simple beat compliments the vocals supplied by ADaD and Jimetta Rose, but the keyboard and wah pedal-doused guitar take the sound to a whole other plain. George Clinton would be proud to hear that his sci-fi experimentations on Mothership Connection and The Clones of Dr. Funkenstein continue to exert an influence on the present day, and the song really saves the more spare and “worldly” (or world music informed, if you like) vibe which dominates both “Ask Them” and “Telemetry”i – the two cuts which follow it and usher in the close of the album. The Constellate LP is out now in a limited edition pressing. Buy it here from Tensei’s bandcamp page.